After a recent and extended excursion to the USA, The Girl and I have been back in Australia for as long as we were away – about six weeks. Unfortunately, the six weeks spent travelling the USA were also six weeks spent very much with each other, whereas the six weeks we’ve been back in Australia have afforded us only fleeting glimpses of each other as we move to and fro through the differing and only incidentally colliding rhythms of our days. To borrow one of my favorite Aussie-isms: it’s not on, mate. In order to re-harmonize our melodies, I booked us a weekend sojourn to Brisbane: two days, one night, zero work activity. There’s really no better way to recapture the feeling of a holiday than, well, taking a holiday. Saturday afternoon found us in South Bank enjoying a sun much warmer than the one we had left behind in Sydney. We eventually found ourselves in front of the State Library of Queensland and amidst a flurry of activity that turned out to be the ongoing Brisbane Writers Festival. Tucked in among the hubbub was a pop-up bookstore. The Girl knows we can’t merely walk past such a thing. Inside I was delighted to find copies of The Answers by Catherine Lacey. This paperback version had a different cover to the American first edition hardcover I had gone out of my way to secure while we had been stateside. It was while comparing the two covers in my head that it occurred to me: if they’re selling her book, she must be at the festival! Having had a parallel thought (how quickly did we re-harmonize those melodies? ), The Girl was on her phone and checking the festival schedule. “So… she’s on a panel in five minutes,” she said. Catherine had been touring the USA while The Girl and I were stateside, but none of her appearances aligned with our travel itinerary. In a few instances, we only missed her being in the same city as us by one day. Now here we were, six weeks later, in Brisbane – my first edition of The Answers in my backpack at the hotel – having stumbled upon her entirely by accident. On the other side of the world. In a city we didn’t know we’d be visiting even three days prior. At a festival we didn’t know was happening. In a location we hadn’t specifically intended to visit. Even removed from the context of the many strange coincidences that saw us sitting there to see it, the panel was wholly fascinating. Catherine and two other authors – Jeff Sparrow and Peter Polites – were discussing the books that had changed them through the years. 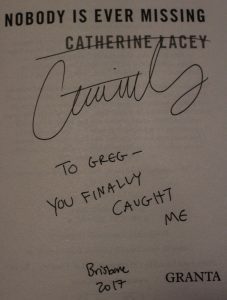 Prompted by an audience question about being read to as an adult, Catherine spoke at length about her and her partner reading aloud to one another and the intimate nature of doing so. The Girl and I gave each other meaningful looks. It was clear what we both wanted to try out that evening. 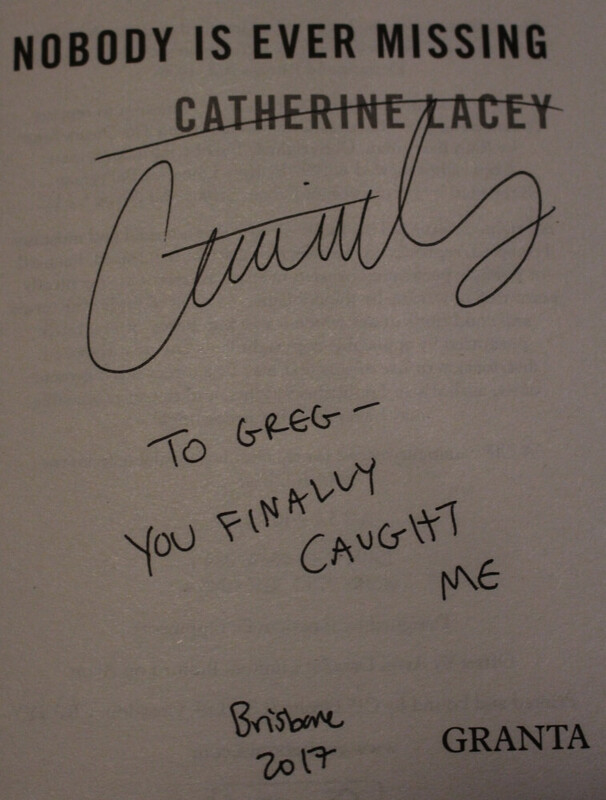 Toward the end of the panel, Catherine noted how easy it is for a reader to feel as if they already know an author of a book they love; to feel as if they’re friends with the author. She made a joke about how the subtext of meeting a beloved author is along the lines of ‘you don’t know it yet, but we already know each other!’ This got a good laugh from a room full of people who would have lived many similar moments. 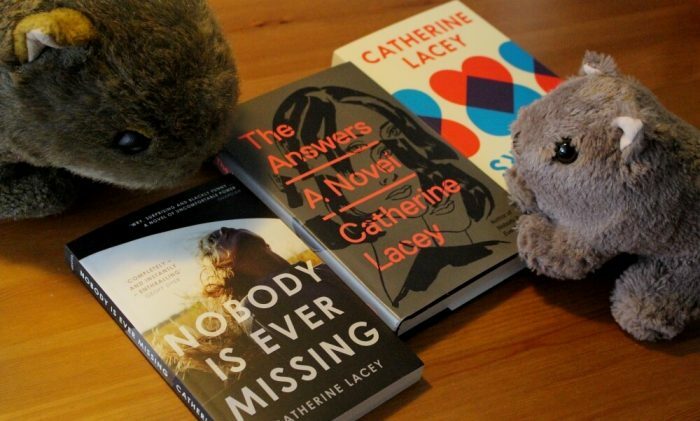 For my part, I don’t presume to know Catherine personally because of my appreciation for her writing, but I certainly have a kind of relationship with the writing itself. Her first novel Nobody Is Ever Missing was one of those miracle books that finds you just when you need it. I encountered it on the Staff Picks shelf at Better Read Than Dead while mired in a day job that was doing a lot to underscore how I’m not built to work a non-creative job. I was drawn into the book that same day, enchanted by the long but lyrical sentences** that represented the thoughts of a character who seemed to think in the same manner I do. I was intrigued by the New Zealand setting, the country from which The Girl’s parents hail but which I had never hopped on the three-hour flight to visit. When my studies would finally afford me the opportunity to make that journey late last year, my travels would be informed by Nobody Is Ever Missing. Specifically, I had not known that there was a ferry between the North and South islands of New Zealand until I read the book. When I rode that ferry myself, the novel was very much on my mind. It was a perfect and random extension of a theme from our USA trip, and the magic of it was not lost on The Girl or I. If you need us, we’ll be reading aloud to each other from The Answers. * This difference in experience is rather easy to explain. The area of West Virginia in which I was born and raised would be a positive outlier in the education attainment statistics of the state as a whole. The (public) high school that I attended is a mainstay in the top ten percent of schools in the state and the local economy is buoyed by technical jobs that require advanced training, if not formal education. Although you wouldn’t have to drive very far outside of my home county to start encountering higher illiteracy rates, such a concern was (thankfully) not a part of my experience when growing up. That said, such realities have not escaped my attention in my adult life. This is the haunted nerve about which I write above. Since moving to Australia in 2009, I have mostly escaped negative stereotypes associated with Appalachian Americans in general and West Virginians in particular. If a person here knows of West Virginia at all, that knowledge typically begins and ends with an appreciation for John Denver’s “Take Me Home, Country Roads” (and they’ll often sing the chorus to me). This has afforded me the opportunity to observe my home state from a safe distance; an almost entirely non-defensive position. It’s a subject for another post, naturally, but hearing about Catherine’s experience did pinch that haunted nerve in a compellingly different manner. I’ve been struggling to get any creative writing done over the past few months. The PhD life has been consuming all of that cognitive energy. Unfortunately, that hasn’t slowed the ideas for stories – they now sit on the neglected pages of my notebook and taunt me from across the room. A collaboration with a dear friend, a few personal essays, and – most dangerous of all – a novel. We shall see. I hope you’re well, friends. Working and writing from home today. Measuring time by the progress of the window cleaners across the street. This is the first post in what should be a fun project: I’ll be using my Instagram feed (@tovagreg) to share microfiction inspired by the photo I’ve posted. I’m not sure what will become of this, which is part of what makes it fun. Mostly the stories will be one-offs but there is certainly the possibility for linked stories and recurring characters down the road. Follow me on Instagram and keep your eyes on ToVa to stay tuned!